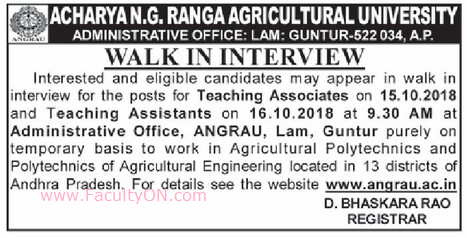 Acharya NG Ranga Agricultural University, Guntur has advertised in the EENADU newspaper for the recruitment of Teaching Associates / Assistants jobs vacancies. Interested and eligible job aspirants are requested to walk-in on 15th and 16th October 2018. Check out further more details below. About University: The Andhra Pradesh Agricultural University (APAU) was established on June 12, 1964 at Hyderabad. The University was formally inaugurated on March 20, 1965 by Late Shri Lal Bahadur Shastri, the then Hon'ble Prime Minister of India. Another significant milestone was the inauguration of the building programme of the University by Late Smt Indira Gandhi, the then Hon'ble Prime Minister of India on June 23, 1966.The University was renamed as Acharya N. G. Ranga Agricultural University on November 7th 1996 in honour and memory of an outstanding Parliamentarian Acharya N.G. Ranga, who rendered remarkable selfless service for the cause of farmers and is regarded as an outstanding educationist, kisan leader and freedom fighter. How to Apply: Desirous and eligible applicants may appear for Walk-in-interview on the date, time and venue specified above along with a type-written Bio-data in prescribed format given below. The candidates should present themselves for certificate verification at the same venue one hour prior to the scheduled interview timing. The candidate should bring a latest Passport size Photograph and all original certificates starting from Xth – Class to till higher degree or Provisional Certificate, as the case may be, together with attested photocopies for this interview.